JC Chasez Photos, News, and Videos | Just Jared Jr.
Taylor Lautner and Nina Dobrev both dress up as Olympic swimmer Ryan Lochte while attending Matthew Morrison’s 2016 Halloween/Birthday Party at Hyde Lounge on Saturday evening (October 29) in Los Angeles. 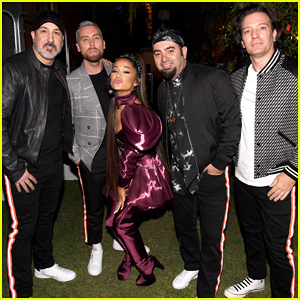 The pair mingled with other famous faces, including Chord Overstreet, Jessica Szhor, Bryan Singer, Chace Crawford and girlfriend Rebecca Rittenhouse as Royal Tenenbaums, JC Chasez as Andy Warhol, Gretchen Rossi, Leona Lewis as an Egyptian queen, and Kevin McHale as a basketball player. “Had a blast in Rio. Oh, and we also won some Gold Medals. #GoUS #RyanLochte #JimmyFeigen,” Nina wrote on Instagram. Chris Colfer is joined by his boyfriend Will Sherrod while dressing up as the flying monkeys form Wizard of Oz at Matthew Morrison’s 6th Annual Halloween Masquerade Ball on Saturday night (October 24) at Hyde in West Hollywood, Calif.
Nina Dobrev was also at the party dressed up as Posh Spice alongside her friends, who were dressed as the rest of the Spice Girls. Chris‘ former Glee co-star Ashley Fink joined him as the Wicked Witch of the West. Matthew Morrison was not able to attend the party as he is currently starring on Broadway, so he sent the below video message. The party was put together by Podwall Entertainment.